As we begin our exploration and journey toward intelligent content, we wanted to introduce CMI’s philosophy on intelligent content and invite you to come along on the journey. If you haven’t seen the movie (and play), The Search for Signs of Intelligent Life in the Universe written by Jane Wagner and starring Lily Tomlin, do yourself a favor and find it. Near its end, there’s a scene where Trudy, a homeless person and guide to aliens (yeah, just go with it), is relaying her experience of taking the aliens to a play. After it’s finished the aliens have goose bumps; they completely loved the experience. But it wasn’t the play that gave them the goose bumps, it was the audience. See, Trudy forgot to tell the aliens to watch the stage. As practitioners of content – don’t we all hope to create that kind of art? One thing I love so much about the intelligent content name is its simplicity that belies the complexity of the ideas it supports. In today’s world, no matter our function in the business, we strive to find smart ways to create, manage, deliver, and maintain our content. 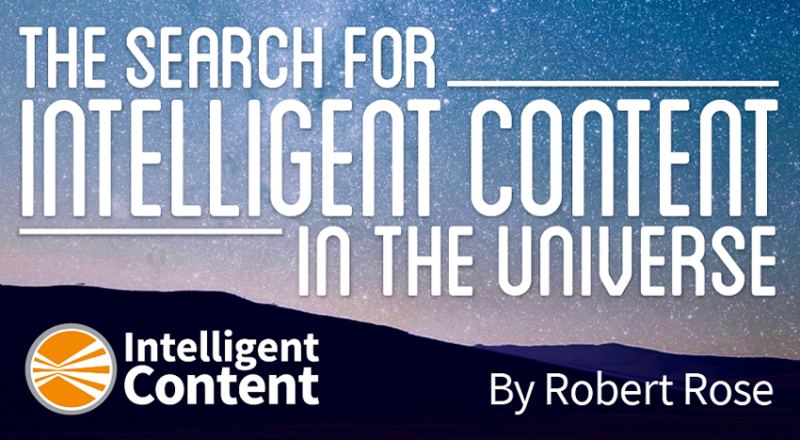 As Content Strategist Rahel Bailie wrote so elegantly in a recent post, intelligent content is an approach that “should be designed to allow future projects to become part of a unified strategy.” In short: To create content as a function intelligently with the goal that future efforts be flexible enough to align to a common content strategy. This is exactly why we at CMI are so excited about bridging the worlds of content strategy and content marketing strategy. As I wrote last year: The practices are separate, but intimately connected. And when connected they share one common, inalienable goal: To foster content as the differentiating asset of the business – and thus content-as-a-function should be a strategic function within the business. And thus our mission for ICC becomes clear: To deliver value to you – the professionals who want to understand the best practices of how to create, manage, deliver, and scale the approach of intelligent content in your business. In short, we will help you develop more efficient and scalable content strategies. Building this community and providing education are something we dare not attempt without both thought leaders and you by our side. We know this works because it is the successful foundation on which we have built the Content Marketing Institute. To that end, we have created an editorial advisory group that will help us navigate through the tricky universe. These advisors will help guide the best practices and foster the solutions that help us reach our mission. Will they always agree? No. Just as we continue to debate the intricacies of content marketing, there is no doubt that passions will reign and, yes, intelligence debated. But the debates will be settled by the results – we will watch you, the audience. That is the art. To launch this initiative, we asked members of our new editorial advisory group their thoughts on what a “beginning” content practitioner needs to know about the approach of intelligent content. Their responses varied, as you might expect, and we’ve truncated some of them for space. We’ll publish them in their entirety in another format in the days to come. The level of content-related expertise is incomparable. The community built by Ann Rockley, and subsequently so many others who are now part of our editorial advisory group, is unlike any I have seen. You simply won’t find a gathering with a higher concentration of passionate thought leaders across the realm of content as a function in the business. Very much like content marketers, the practitioners in the room are searching for their strategic place in the business. The landscape of business is changing fundamentally, but so many content practitioners come from such varying backgrounds it can be difficult to find the “right place” for the intelligent content function to sit. In many ways, just like so many content marketers, content strategists are orphans – looking to find a permanent home in the business universe. Content marketers to find powerful new practices and allies to help scale their efforts and make their approach more strategic. Content strategists to find friends in marketers who are developing deeper, more valuable content-driven experiences to differentiate the business. Individuals who identify as both content marketers and strategists to find new colleagues with whom to share, learn, evolve, and expand their efforts. And those who haven’t identified themselves yet will simply find new friends and guideposts to help them develop a career that’s meaningful to their passion. It’s a grand adventure ahead. 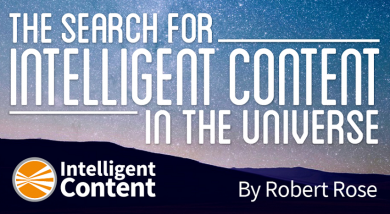 The search for intelligent content in the universe is on. Let’s go find it together. Want to join us on this adventure? Sign up for ICC’s weekly email newsletter to stay involved in conversation.